The apparel retailer industry is a disaster, and premium brands are no exception. Popular names, such as Abercrombie & Fitch Co. (NYSE:ANF) and American Eagle Outfitters (NYSE:AEO), are down 20% and 23% year-to-date, respectively. Even off-season discounters like Ross Stores, Inc. (NASDAQ:ROST) can’t seem to gain any traction. Ordinarily, we’d assume any apparel retailer is dead on arrival. 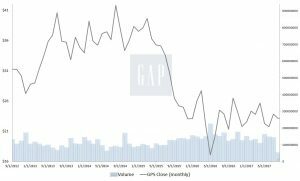 Gap Inc (NYSE:GPS), however, is making a compelling case for itself. First off, GPS stock is in the black this year. Although its barely-one-percent gain is minuscule compared to broader benchmarks, it’s quite an accomplishment against apparel-makers. Several retailers are closing their doors for good. The fact Gap can continue to keep the lights on is remarkable. Furthermore, GPS management is making painful but necessary decisions to eliminate unprofitable store locations. Better yet, the Gap stock recovery isn’t just based on speculation of good news. The company surprisingly delivered the goods in its first quarter of fiscal 2018 earnings report. Against an earnings per share forecast of 29 cents, GPS instead forwarded 36 cents, or a 25% earnings surprise. More impressively, Gap demonstrated growth in a quicksand market, with same-store sales rising 2% thanks to Old Navy roping in its own comp gain of 8%. Although total first-quarter revenue was just a hair above the year-ago quarter, the results fell in line with expectations. Against the broader context of apparel retail, the first quarter was a big win for GPS stock holders. At the same time, the challenges Gap faces cannot be solved by an earnings report. As our market strategist Anthony Mirhaydari wrote earlier this year, ” … the American shopper is suddenly snapping their wallet shut.” This isn’t just an anecdotal observation; Consumer sentiment is negative since Donald Trump took office. Can the upcoming second-quarter earnings report for GPS stock decisively turn things around? Analysts pegged Gap earnings at 52 cents, which is slightly toward the bearish end of the spectrum. Estimates ranged from 49 cents at the low to a high of 56 cents. For the year-ago Q2, analysts called for a consensus estimate of 59 cents, with actuals coming in a penny higher. Zacks Equity Research predicts an earnings beat for this year as well, citing GPS stock momentum and revamped operations. Cost-cutting initiatives, product-style changes and improved supply-chain efficiencies boosted prior turnaround efforts. I also believe that Gap stock has a great chance at beating Wall Street’s forecast. Since at least Q1 FY 2015, GPS has either met or exceeded earnings expectations. Unproductive store closures and cutting dead weight should go a long way in boosting the bottom line. Where the top line is concerned, I admire Gap’s “omni-channel” approach. Through various options including order-in-store, reserve-in-store, find-in-store and ship-from-store, customers have multiple avenues to find what they’re looking for. Additionally and most significantly, the ship-from-store option allows Gap to compete with Amazon.com, Inc. (NASDAQ:AMZN). The question is whether this refreshed strategy will interest impatient investors into buying GPS stock. It’s one thing to implement a new operating methodology. Target Corporation (NYSE:TGT) implemented its own ship-from-store channel a few years ago to disappointing results. The markets brutalized Target shares, while perennial rival Wal-Mart Stores Inc (NYSE:WMT) comparatively skyrocketed. At this juncture, it’s important to separate Gap, the story, from GPS stock, the investment. While pundits may applaud the company’s can-do spirit, the markets may take a more negative view. I’ve said this many times before on other earnings previews, but it really comes down to the guidance. The street needs to see realistic growth potential. If sales trends are forecasted to remain flat, I’m not sure what else you can sell. For example, the company’s dividend yield of 3.8% is mighty enticing. On the other hand, organizations in stable industries offer similar passive income without the volatility risk. Click to Enlarge Technically, the picture surrounding GPS stock is ambiguous. At its absolute highest point of this year, Gap shares were up 19.4% against its January opener. But the peak-to-trough loss this year amounts to nearly 21%. Translation — you have to get Gap stock just right or it will punish you. While I’m a big fan of comeback stories, I don’t trust GPS stock enough to make an affirmative recommendation. I also don’t trust the apparel-retailer industry. The sector essentially peaked in the late 1990s. Currently, too many competitors exist in the space, rendering a turnaround attempt highly questionable. Article printed from InvestorPlace Media, https://investorplace.com/2017/08/gap-inc-gps-stock-cant-defy-industry-headwinds-much-longer/.